In their target article to appear in Behavioural and Brain Sciences, Hoerl and McCormack outline a dual systems approach to temporal cognition, which distinguishes between two cognitive systems for dealing with how things unfold over time – a temporal updating system and a temporal reasoning system – of which the former is both phylogenetically and ontogenetically more primitive than the latter, and which are at work alongside each other in adult human cognition. They describe the main features of each of the two systems, the types of behavior the more primitive temporal updating system can support, and the respects in which it is more limited than the temporal reasoning system. They then use the distinction between the two systems to interpret findings in comparative and developmental psychology, arguing that animals operate only with a temporal updating system and that children start out doing so too, before gradually becoming capable of thinking and reasoning about time. After this, they turn to adult human cognition and suggest that our account can also shed light on a specific feature of our everyday thinking about time that has been the subject of debate in the philosophy of time, which consists in a tendency to think about the nature of time itself in a way that appears ultimately self-contradictory. They conclude by considering the topic of intertemporal choice, and argue that drawing the distinction between temporal updating and temporal reasoning is also useful in the context of characterising two distinct mechanisms for delaying gratification. Some of the conventions associated with the most ubiquitous artefacts that we employ to represent time are so deeply entrenched in our culture and practice that we tend not to notice what is contingent in their design; and hence we tend not to reflect on, and question, what considerations should be most relevant to their design. Sense of Time is a new collaboration between designer Ted Hunt and King’s College London’s Department of Philosophy, questioning how does the way we view time influence how we value and occupy time. Is ordinary thinking about time inconsistent? In their paper ‘Thinking in and about time’, Hoerl and McCormack propose that adult human cognition involves the operation of two separate systems, an ‘updating system’ and a ‘reasoning system’. A crucial piece of evidence they offer is the tendency of ordinary temporal thought to produce inconsistent judgments. I argue that this picture of their interaction cannot be right, and, in particular, that ordinary thinking about the past involves features associated with both systems, but without the sense of conflict that their account predicts. This suggests that dual systems theory, as an account of temporal thought in mature humans, needs to be revised, or else a more refined account offered of the interaction between the two systems. Developing Temporal Reasoning Is Less Important Than Other Developments of Temporal Updating. What can a mind with a Temporal Reasoning System (TRS) do which a mind with a sufficiently complicated Temporal Updating System (TUS) could not do? Hoerl and McCormack argue that the development of the TRS is important because it allows representation of a temporal order to come apart from the order in which items are presented, and because it can be used for intertemporal decision making. I argue that a TUS could do both of these things in many contexts, suggesting TRS/TUS may not be the most important distinction in temporal cognition. I raise two concerns. First, by considering evidence that does not concern mental time travel, but instead concerns short timescale multimodal temporal order perception, I argue that there are reasons for thinking that animals must also be capable of mentally representing some of the temporal properties of events. Second, H&M accept the existence of internal clock mechanisms, yet deny that these mechanisms attribute temporal properties to the environment. However, based on the adaptive advantage provided by these mechanisms, I argue that we should interpret them as genuinely attributing temporal properties to external events. How to discuss duration and continuity in Mental Time Travel through a dual systems perspective on temporal cognition? The present communication aims to discuss the consequences of a dual systems perspective on temporal cognition to the philosophical debate on mental time travel. 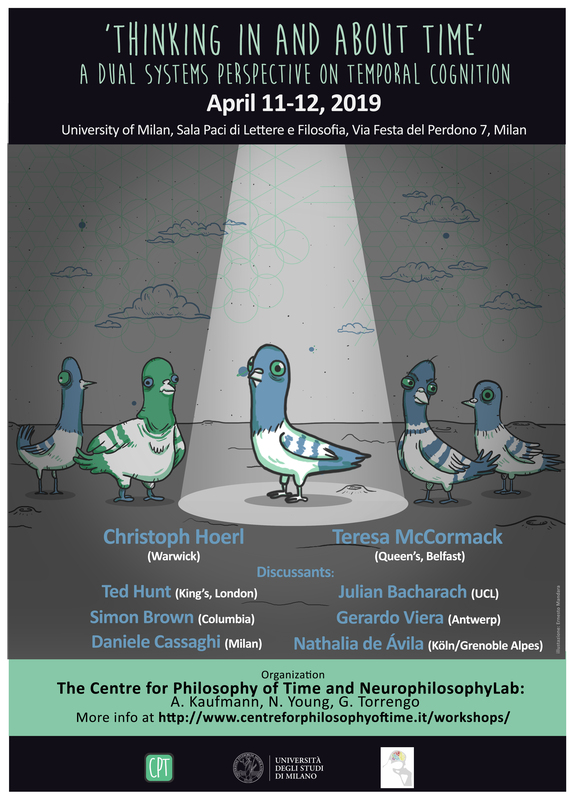 The temporal structure that is inherent to this cognitive ability has not been the focus of most of the theoretical debates on the matter and the conceptual nuance that has been established by Hoerl and McCormack definitely makes a contribution to this problem. My intention is approaching this debate mainly from the following topics: a) Firstly, due to the fact that the grasp of the temporal linearity of time is presupposed as something acquired at an early age in the target article, we might have the impression that the future is, following the Augustinian argument, always interpreted as a chronological moment which has not happened yet. However, due to the possibility of future anticipation in MTT, the chronological distance between past and future or present and future could present a temporal structure that is more complex than a line in human adults. So, what does the temporal reasoning system allow us to think in terms of mnemonic temporal structure? ; b) Secondly, if I admit a certain “co-existence” of past and future representations in MTT, what could this tell us about the feature of temporal continuity, if two moments in time that were supposed to be distant and obey a before-and-after sequence are represented in a more linked way? ; c) Finally, does that add anything to the discussion on the perception of duration, which is a pre-requirement for temporal reasoning? Thinking in and About Time and Phenomenology. McCormack and Hoerl propose a double system for temporal cognition: the more sophisticated temporal reasoning system and the more “primitive” temporal updating system. One of the issue they rise is that conflicting outcomes of the two system may be at the base of the disagreement in philosophy of time about the existence of A-properties. The major argument for A-properties relies on our alleged phenomenology of time passage, grounding our belief in A-properties. Since the primitive updating system is responsible for the generation of such a belief, it seems reasonable to the generation of such phenomenology is imputable to the updating mechanism. The question comes to be how to conciliate this latter suggestion on the idea of a no-phenomenology of passage previously held by one of the two authors. 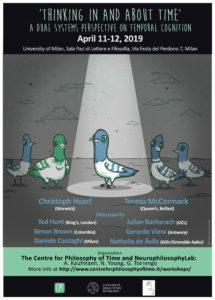 The event is funded by the Department of Philosophyof the University of Milan.